Inside out Christmas . . .
Of course all this talk of missing pieces – or the missing batteries might suggest that I’d be asking ‘What is missing to make your christmas complete – or rather whom? ?’ But I’m not . . . it would be most misleading to say that we need Jesus to make our Christmas complete – for Jesus isn’t part of Christmas . . .
Because it’s the summer – many of us will be heading away for a break and now more than ever holidays are about the accumulation of ‘experiences’ – perhaps bungie jumping? Or visiting a vineyard? Or sky diving? But there is one experience which everyone here has in common – can anyone guess what it is?? Actually this experience is common to everyone who has ever lived and who ever will live . . . and none of us can remember it – it is the experience of being born! When you and I were born we came into a world of which we have no sense of ownership – we don’t even begin to have the language to say – ‘this is my world’ – although ‘Mine’ is a word most of us pick up in our very early days . . . yet how easily we say that ‘Jesus is born into ‘our’ world’ . . . where do we learn this way of speaking about things? That the message of Christmas is that God has come to us to be with us in ‘our world’ as if God was somewhere else? – perhaps lived in a different world – like a long lost relative visiting from the other side of the world . . .??? How often do we hear – ‘God in Jesus is born into our world’ . . . without thinking for a moment about it. In the beginning was the Word, and the Word was with God, and the Word was God. He was in the beginning with God. All things came into being through him, and without him not one thing came into being. ‘. All things came into being through him, and without him not one thing came into being’. Jesus came into our world? The babe of Bethelehem is born into that which he has himself created . . . He prepared a world to be born into! YET . . . Yet to all who received him, who believed in his name, he gave power to become children of God, who were born, not of blood or of the will of the flesh or of the will of man, but of God. The message of Christmas is that by and large we have got Christmas inside out – it is not that God is on the outside of our world and is born into it – rather that he is at the heart of it and comes to us who are on the outside – cut off from his life and promises that we might be born again, born into His Life, to know the world as it really is. Jesus has not come to join in with Our Christmas, to share in our lives – he has come that we might share in his . . .
One of the great difficulties for us as Christians, especially in our day and age, is that we are completely unaware of the great biases we have. The logs in our eyes. Believing that we ‘know everything’, we are even more profoundly disabled by our ignorance. Like a stubborn older person who won’t use a walking stick ‘because people will think I am old . . .’ our pride leads us into terrible problems – not least when it comes to Knowing our faith as it has been passed down to us. ‘We know better nowadays’ is the mindless mantra drilled into us from our first encounter with what is falsely called ‘knowledge’. That the generation which knows so much is watching as the creation collapses around us, whilst simultaneously checking out pictures of cats on Facebook, betrays our deep ignorance of anything in the Real world. Hence the significance of The Tradition which Roots us in Christ and the Church and thus, anchored in Reality. Our faith is Traditioned, it is handed down to us – we are given sight and understanding through the Grace of God by His Spirit, and don’t make it up for ourselves. And sight and understanding are embodied in a language. Christians when we are speaking truthfully speak differently to those amongst whom we live. But, like anyone living in a strange land – we are tempted to try and fit in – we are too easily embarrassed by the things that make us seem odd, which make us stick out. The dominant culture shames us more or less subtly for our foolishness in thinking and speaking in such and such a way, not least when it comes to how we address God. Father, Son and Holy Spirit, for ever praised. Indeed our own NZ prayer book, seeking to fit in and hiding shamefully behind the fig leaves of cultural relevance, invites us to name God for ourselves. the Power to name is the power to define – our Gift is to name all that which God has set under us, to seek to name God is no less than to make ourselves God. Finding volunteers to be Kings – or even shepherds? No problem! Good strong male characters, but Joseph? Everyone knows that Joseph is just a bit part in the story – he just has to tag along and look after the main player. All the photos afterwards are with the mother – babe in arms. For frankly who would want to be Joseph – indeed Joseph himself in all likelihood wasn’t terribly struck by the idea. Upon realising that his betrothed is inexplicably with child, his first response, ‘being a righteous man and unwilling to expose her to public disgrace,’ was to resolve to ‘dismiss her quietly.’ Let us not suppose darker motives – for Matthew tells us Joseph is a ‘righteous man’ – such a description is not to be taken lightly. What might be in view here is simply to quietly and privately ‘write her a certificate of divorce’ – rather than go to public trial over the matter, and thus ‘expose’ her, for he is a good man. The Woman is not to be exposed. Whatever, he is in a very difficult situation – but perhaps that is nothing compared to a deeper matter – that he is not the father. He is a little more than an extra – having no agency. like the unwilling boy in the nativity, told where to stand – Joseph is told by the angel what he must do – a passive player in the drama of the birth of Christ. Removing the male from the action when God sets about his most profound work, is a common theme in Scriptures First Adam is asleep as Eve,’the mother of al the living’ is created, then Abraham is asleep as God pronounces his covenant, and I could go on – Joseph of course only gets his orders, whilst he is asleep, only the men see visions and dream dreams – when God speaks to them they are asleep – Joseph is told, there is no conversation, his agency is purely to do as he is told. And again as he must take the infant Jesus to Egypt, the instruction comes not whilst he is at work, but whilst he is asleep . . .
Perhaps it is no surprise that little boys aren’t eagerly queuing up for this nativity play role. But I suggest that both the feminine eagerness and the masculine lack thereof both point us to something deeper. As I said we shall contemplate Mary this evening – but Joseph . . .
You see, the issue is quite plain at one level, he is not the father. Joseph is not the father – he must bring one up as a father but without being the Father – The Father. As I’ve already mentioned – our modern western culture finds the name of God as traditioned – as handed down – Father, Son and Holy Spirit – embarrassing. A throwback to ‘a patriarchal and therefore oppressive way of seeing gate world from which we have now been liberated’. But this is a profound and tragic error on several levels. Put another way – you cannot define God by your earthly understanding of ‘father’ – to be ‘Father’ is something that can only be known in reference to God. God in moving Joseph to one side reveals the utter inadequacy of the human male as a reference point for fatherhood. If we are to know what Father means, we must look to God, only in Knowing God, do we Know the Father. Jesus looked up to heaven and said, ‘Father, the hour has come; glorify your Son so that the Son may glorify you, since you have given him authority over all people, to give eternal life to all whom you have given him. And this is eternal life, that they may know you, the only true God, and Jesus Christ whom you have sent. This morning we considered Joseph – so in the interests of equality it is only reasonable that tonight we consider Mary. I say ‘equality’, but it is notable that neither the Scriptures nor the Tradition treat Mary and Joseph as if they were equal . . . and as I said this morning we are wired by our culture to read texts in a certain way. If I say that ‘the Scriptures do not treat Mary and Joseph as equals’, then if we did not know any better we might fall into a lazy and easy assumption that Joseph as the man is held in far higher regard in ‘these patriarchal and outdated Scriptures’ than the ‘mere woman’ Mary, except of course, we know that is not so. Indeed, nothing could be further from the truth. Joseph is that oxymoron – a ‘passive actor’, more fully a passive male – in the drama of the birth of Jesus. The birth of God into the World does not include Joseph – He does not speak a word. He is told what to do whilst he is asleep – in a dream. It is worth asking whether, because we live in a society which is profoundly masculinised, we fall too readily for the suggestion that the male is central to the Scriptural account and so fail to See, and be amazed by how marginal the male is in this narrative of the birth of Jesus. Indeed as we explored this morning, do we miss the force of Jesus’ words ‘call no one your father on earth, for you have one Father—the one in heaven.’ That is, there is no earthly referent with regard to Father? When God reveals himself as Father, actually we are told not to try and interpret Father with reference to the male human?? The man Joseph gives us no clue to the meaning of ‘Father’, the Name Father by which the Spirit bears witness with our Spirit that we are children of God. We Know God as Father, but that is a profound divine mystery for He is in heaven and there is not earthly example – not even St Joseph. How different to Mary! This morning we contrasted what happened at nativities. Children as I so often say get it – they are in spiritual terms ‘thin places’ that is they are Open. In some respect this is MOST hazardous – children in this age as much as any other are exposed to many and terrible things – they are utterly open and we are utterly careless. We are all about protecting children, for they are utterly vulnerable and, in the next breath in the name of ‘education’ we put devices in their hands which which are doorways for much that they are not able to comprehend or worse which can literally destroy their souls – to Know everything – Good and Evil. Yet, at the same time, whilst there are still children in the Church, by grace they come to know God in Jesus, and Mary his mother. And that maternal instinct finds its correlative in the role of women in the faith who faithfully pass on Life in the Tradition. It is interesting to note that in the latter part of the C19 in Russia, some of the saints of the Church gave themselves unstintingly to instructing women in the faith. When the Church then endured the horrific suffering under Communism, as we all know it was the women who bore the faith, who carried it within them and transmitted it. What after all is it to become a Christian than to be ‘Born Again’ . . . the question of Nicodemus at this assertion not perhaps without some weight . . . It is an observable principal that whilst the male teaches the dogma of the faith, it is the woman who passes on the Essence of The Faith, its Being, The Mystery of Faith – in a far deeper instinctual way – the way of Mystery. At my daughter Rose’s wedding I made reference to those who were missing – including Sarah’s mother who kept faith alive in her family and passed it to her daughter, and then through her mother, Rose and indeed all of our children. Life passes through the female. 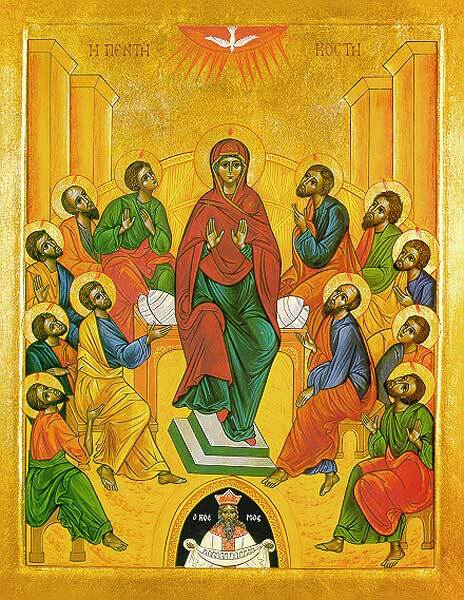 The female is the life giver – so, rather than equality – compared with Joseph and indeed Any other Saint, The Church has exalted Mary – calling her ‘Theotokos’ – literally the one who bears God. The frail finite encompassing the consuming Fire of the ‘infinite’. Frail human flesh bearing the One who is a consuming Fire . . . Our God, incomprehensibly contracted to a span within a Woman. In front of you you have two icons of Mary, The upper one is called ‘the Hodighitria’ – Mary points us to Jesus, she posts us to the Way, and Christ blesses his mother – As the Father speaks from Heaven ‘This is my Son, the beloved, Listen to Him, so Mary also directs us to her Son. At the wedding of Cana, ‘Mary said to the servants, ‘Do whatever he tells you.’’ This icon is so significant that mariners of Old would place it in the bow of the boat The Virgin Mother pointing us to Jesus, ‘the Way’. Within her occurs the incarnation – the weaving together of heaven and earth – thus as as heaven is woven into Earth, so Jesus is The Way in toto. As Eve is named for she was ‘mother of all the living’, so Mary is the Eve of the New Creation – it is her ‘Yes’ which is the doorway for the life of God into the world, the Spirit of Jesus, that we might be born again. It is perhaps not going to far as some assent, that Mary is The Church – for the Church is the body of Christ – she is the one who within herself holds that body – she is the one who gives of her flesh that God might be born into the world. 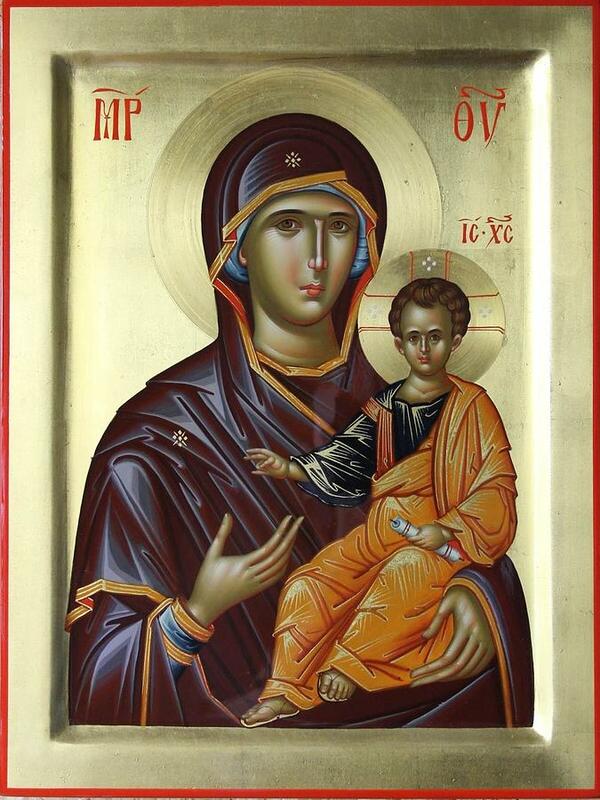 So in the second Icon as is customary we see Mary seated in the centre of the Church, our Mother. Now it may have become apparent that I have been weaving together the story of Mary with that of Women in the Church, perhaps a note that we have lost. As The Church has forgotten the way in which the story of Joseph (and indeed many other men in the Scriptures who have to be asleep for God to work) puts the male out of the picture – so there has been in the Western tradition of the Church an approach to Mary which has divorced her from Womankind, and allowed the dominance of the male – to the point where as many say ‘it is a man’s world’. Neither Joseph not Mary conform to the way we are told the world is – which is a Sign to us that we are failing to See the World as it truly is – as God created it to be. Deep in the story of Creation we come upon the story of the Fall. Why should the Serpent tempt Eve? Of course, if we wear the glasses modern thought has put upon us we would say ‘well here is an example of a Patriarchal text! The woman is being portrayed as weak, so Satan goes for the weak point’ This however is not how the Deep tradition of the Church reads it at all! No! The Woman is Receptive – that is at once her profound Strength and also the Potential of weakness. Of Glory, or of Shame. As the Ancient story of Achilles tells us, the weak point is always found in regard to the Strength. Rather the Woman in the Story is portrayed as the pinnacle of God’s creative work. God’s Creative act culminates as he puts the man to sleep that he might do his most mysterious work – this is a Hidden thing. It is something which we can only begin to know in the Church in the Body of Christ. It cannot be known from outside of faith. The Serpent takes on Eve precisely because he knows that She as Woman is the source of Life for the human – both physical and spiritual. If he can deceive her, then all of humanity is lost. Eve receives the apple – she takes it into herself, and so the knowledge of Evil enters the world. How might this be redeemed, by the Woman taking Good, The Good into herself, in her ‘Let it be to me according to your Word’ Mary receives the Word of God into her being for the Salvation of the World. As Karl Barth put it, ‘here the Woman stands absolutely in the foreground.’ Yet this is hidden – it is a veiled truth for it is the stuff of mystery, the essence of Life and the feminine. She stood before Frodo seeming now tall beyond measurement, and beautiful beyond enduring, terrible and worshipful. This Truth is veiled. It is in the secret places that Jesus is woven together – it is the hiddenness of the humility of Mary that God comes into the world. It is only with the eye of faith that this young Jewish girl might be known as the Queen of heaven, it is not now public fact – the one who’s yes to God was for the Salvation of the World. And it is this profound mystery which is at the heart of the Eucharist – for because Mary received Life in and through her Yes to God, so the One born to her feeds us with His Very Life in the Eucharist. In her ‘Let it be to me according to your Word’ – the Wedding Feast of the Lamb comes into being.